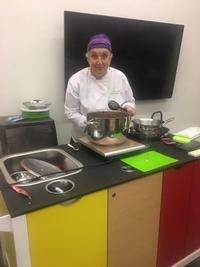 If you walk into the South Philadelphia Library meeting room on a Monday afternoon between 4:00 - 6:00 p.m., you’ll find a group of children, teenagers, and adults chopping, grating, and peeling fresh veggies to learn about vegan cooking from Chef Char Nolan. Nolan is a plant-based vegan with tons of enthusiasm for converting your favorite meals into meatless option. 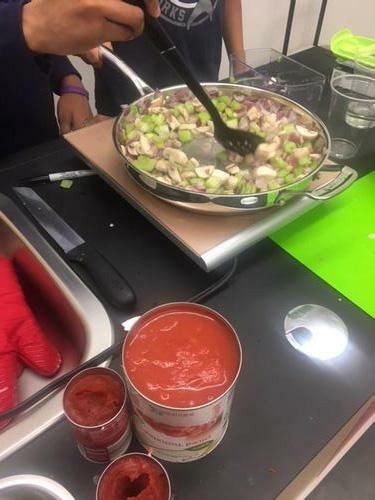 During her weekly Meatless Mondays program, she uses the South Philly Library’s Charlie Cart to give everyone hands-on experience making the week’s recipes. The Charlie Cart is a mobile kitchen provided by the Culinary Literacy Center through a partnership with Dietz & Watson to support the Free Library of Philadelphia’s efforts to advance literacy through food and cooking. On the menu back in December: vegan chili (recipe below! ), with toppings including guacamole, and hot cocoa. As people walk in, they’re put to work chopping and grating. Char asks a participant to read the label on the chili sauce—no fat, low sodium. Bingo! Three teenagers man the hot plate together to start the chili, taking turns stirring. While the chili simmers on the hot plate, we move onto the hot cocoa recipe. This vegan hot cocoa is made with soy milk, cocoa powder, dates, and vegan marshmallows. We use the cart’s Vitamix blender to blend these ingredients and heat them up. While it’s mixing up, Char asks for a volunteer to read the label on the container of dates. She teaches the class that dates are a sweetener but also contain vitamins and iron, unlike the white sugar you buy in a bag. Our first two taste testers think it isn’t sweet enough, so we add a few more dates and try again. Everyone loves it! Next up, the toppings bar! We’re making "lazy guacamole" today, which means adding an extra avocado or two to store-bought guacamole. We also have hummus, diced cherry tomatoes, and chips for dipping. The chili smells amazing and more library patrons are walking by to look in the windows of the meeting room. Once Chef Char starts serving up her vegan chili, another half-dozen people walk in and line up. Everyone adds their favorite toppings and then we talk around the table about what to make next week. Meatless Mondays challenges people to think about eating a plant-based dinner one night each week. Going meatless once a week can help reduce your risk of chronic, preventable diseases like cancer, cardiovascular disease, diabetes, and obesity. Started by Sid Lerner and the Johns Hopkins School of Public Health in 2003, the Meatless Mondays movement encourages people to make meatless and vegetarian meals part of your day-to-day life. Americans on average eat 270 pounds of meat per person per year. Starting with Meatless Monday, skipping meat one day a week is good for you and better for the planet. It can also be good for your wallet! Why Monday? Studies show that you’re more likely to adopt healthy behaviors on Monday than any other day of the week. It’s the first day of a new week, and many view it as a fresh start to their healthy living goals. Wondering how to get started? 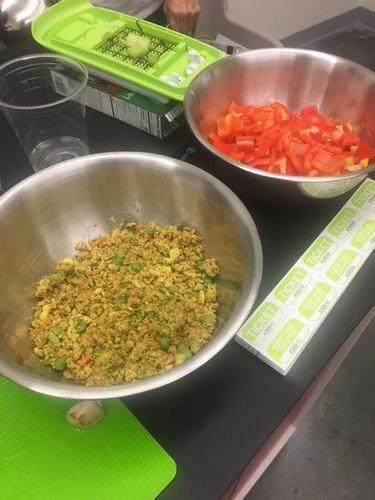 Start your week off right with a Meatless Mondays class at the South Philadelphia Library on Mondays at 3:45 p.m. Upcoming dates include January 22 and 29 and February 5, 12, and 26. You can also check out this booklist that can help to inspire your own Meatless Mondays! 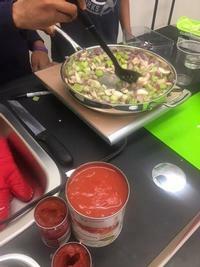 Now to make your own South Philly Chili at home! 3 cans of beans (Any type. We used black, pinto, and kidney) Rinse the beans off with water, to remove any excess sodium. Once the vegetables are sautéed and soft, add tomatoes, spices, and stir well. Add crumbled veggie burgers and nutritional yeast. Stir and simmer for 45 minutes on a low heat.